For five generations and 140 years, the Globe Dye Works dyed and wound yarn, and employed hundreds at its peak. In 2005, unable to continue fighting the globalization and outsourcing that moved other businesses, Globe closed, ending another vestige of Philadelphia’s past as the Workshop of the World. Its 11 buildings and 165,000 square feet, located off Torresdale Ave. in the Frankford area of Northeast Philadelphia, were shuttered and left vacant. That's when six partners decided to give the compound new life as a work space for the creative economy, all with an eye on the environment. 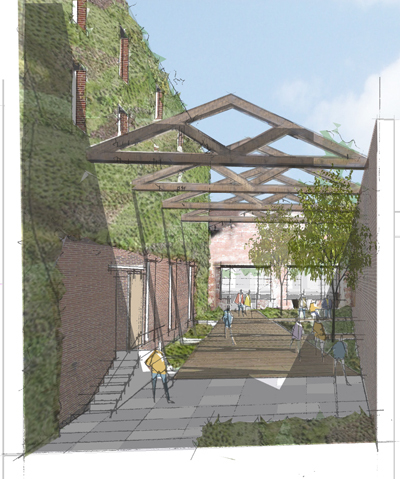 Abdo and the other members of the Globe Development Group are finding green answers for common obstacles faced by those renovating Philadelphia’s vast collection of old manufacturing and warehouse facilities. They hired award-winning local architects Digsau to implement a massive green overhaul, including a widespread stormwater management system, which will capture rainwater from the roofs of their 11-building compound and use it for their planned landscaping. On the largest, southern roof, they plan a highly visible solar array. They’re also planning to use empty oil and boiler tanks for graywater storage and unique planters. What was once a dying dyeing factory now houses light industry, including a metalsmith, a woodworker, a steel drum manufacturer, artists—a photographer and a former chairman of the University of Pennsylvania’s fine arts department—and an antiques wholesaler. Globe isn’t the only industrial building getting a makeover. With two additional partners, David Gleeson led the development of Kensington’s Crane Arts Building. Once the abandoned, century-old former headquarters of the Crane Plumbing Company, it now boasts a permeable surface parking lot, combining large concrete slabs and Belgian block to allow for natural storm water runoff. Leo Addimando and his partners renovated a metal castor factory into the art and workspaces of 2424 Studios in Fishtown. They funnel their heating and cooling systems to get more for less, and a white roof reflects summer heat. “We also used as many materials from the existing building as possible,” Addimando says, pointing to the original concrete and wood floors, which were refinished. Of course, there are obstacles to outfitting an old factory. Abdo says Globe Development went over-budget when retrofitting the building’s electric and sprinkler systems, a great challenge in the aged, sprawling compound. Heating and cooling is another battle for energy-efficient warehouse repurposing. At Globe Dye Works, new, heavily insulated roofs were added, and they’re slowly replacing existing windows with energy-saving models. The building’s age and size also made becoming LEED-certified an impractical goal, Abdo says, but the measures they are taking mark a positive shift in building practices.